Mesothelioma patients and family members should know the statistics regarding their disease as well as its causes and the treatment offered. Mesothelioma is a form of cancer that is caused by exposure to asbestos. It affects the mesothelium of the lung (pleural), heart (pericardial), or abdomen (peritoneal). Although there is no cure, the survival rates for mesothelioma patients have been improving as research advances. 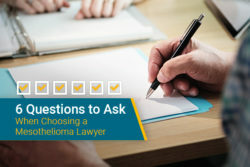 The best way to improve your survival rate is by seeing a mesothelioma specialist. 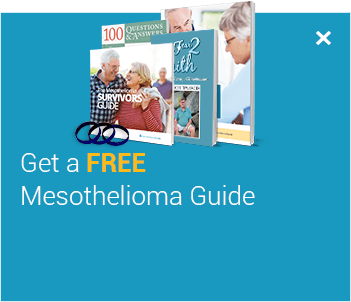 You can find a mesothelioma specialist for your specific diagnosis by using our free Doctor Match program. Approximately 3,300 people are diagnosed with mesothelioma every year in the United States. Symptoms of mesothelioma typically do not appear until 20 to 40 years after being exposed to asbestos. Men are 4 times more likely to be diagnosed than women. 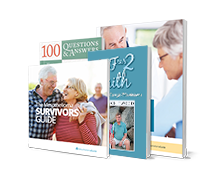 The common age range for a mesothelioma diagnosis is 50 to 70 years old. 3 out of every 4 cases are pleural mesothelioma. About 75% of patients are diagnosed with this type of mesothelioma. 20% of mesothelioma cases are peritoneal. 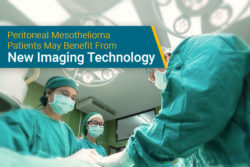 In the United States, there are about 250 new cases of this type of mesothelioma every year. From the years 1999 to 2015, there have been 45,221 deaths due to malignant mesothelioma. Asbestos is the only known cause of mesothelioma. Asbestos is a fibrous mineral used in various products because of its resistance to heat, fire, and chemicals. The most common way that people are exposed to asbestos is by occupational exposure. About 125 million people have been exposed to asbestos in their workplace. Asbestos was in many products used by the U.S. military. Some ways a veteran may have been exposed to it is by working in mining, shipyard work, construction, or demolition. 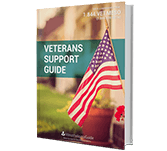 If you were exposed to asbestos in the military, our free Veteran’s Support Guide provides detailed information on finding financial support and treatment specifically for veterans. Mining for asbestos in the United States officially ended in 2002. Currently, 61 countries have either partially or fully banned asbestos, but the United States hasn’t. Chrysotile asbestos is the only type of asbestos that is still imported in the U.S. In the last decade, 8 million pounds of asbestos has been imported to the U.S. In 2016 the U.S. imported about 340 tons of asbestos. 107,000 people worldwide die from asbestos-related diseases every year. Asbestos kills 12,000 to 15,000 people per year in the United States. The 3 most common forms of asbestos are Chrysotile (white asbestos), Crocidolite (blue asbestos), and Amosite (brown/grey asbestos). Crocidolite is believed to be the most harmful type of asbestos because its fibers are long and thin. Asbestos can be found in insulation, roofing shingles, and many automobile products, such as brake pads. In 2016, asbestos was picked among the first 10 chemicals to be reviewed by the revised Toxic Substances Control Act. "Veterans are the largest group of patients diagnosed with mesothelioma each year." There is no known cure for mesothelioma, however, there are many treatment options that are available to patients. 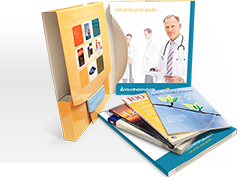 A patient may choose to have surgery, chemotherapy or radiation. They may also experience multimodal treatment or participate in clinical trials. Sometimes a patient cannot participate in some treatment options because of how advanced their diagnosis is. In this case, treatment may be used to help provide them with comfort. of mesothelioma patients DO NOT receive any type of treatment. Hyperthermic Intraperitoneal Chemotherapy (HIPEC or “Hot Chemo”) is sometimes used in treating patients with peritoneal mesothelioma. This procedure was developed by Dr. Paul Sugarbaker. During this treatment, heated chemo is applied directly to the abdominal region during cytoreductive surgery and it kills any remaining cancer cells. Extrapleural pneumonectomy (EPP) is an option for pleural mesothelioma patients. This treatment was developed by Dr. David Sugarbaker and it’s one of the most successful surgical options for mesothelioma patients. During EPP, the surgeon removes the entire lung, part of the pericardium, and part of the diaphragm. Palliative (pain-relief) treatments options may include a thoracentesis, pleurodesis, or a shunt placement which relieves pressure. More than half of mesothelioma patients will participate in clinical trials. 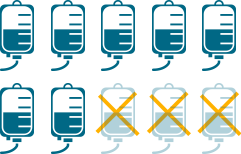 As of 2011, about 175 clinical trials have occurred. You can get connected to a clinical trial that is specific to your diagnosis, by using our find a recruiting trial search. Unfortunately, 20 to 30% of mesothelioma patients do not receive any type of treatment. 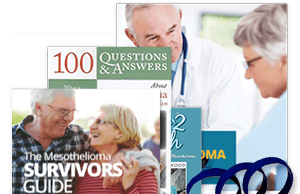 MESOTHELIOMA STATISTICS | MESOTHELIOMA FACTS | MESO FOUNDATION. Mesothelioma Applied Research Foundation. Retrieved from: http://www.curemeso.org/site/c.duIWJfNQKiL8G/b.8578843/k.AF18/Mesothelioma_Statistics__Mesothelioma_Facts__Meso_Foundation.html. Accessed: 10/10/18. Mesothelioma: Statistics. Cancer.Net. Retrieved from: http://www.cancer.net/cancer-types/mesothelioma/statistics. Accessed: 10/10/18. What Are the Risk Factors for Malignant Mesothelioma?. American Cancer Society. Retrieved from: https://www.cancer.org/cancer/malignant-mesothelioma/causes-risks-prevention/risk-factors.html. Accessed: 10/10/18. Mesothelioma. National Organization for Rare Disorders. Retrieved from: https://rarediseases.org/rare-diseases/mesothelioma/. Accessed: 10/10/18. Malignant Mesothelioma Mortality — United States, 1999–2015. Centers for Disease Control and Prevention. Retrieved from: https://www.cdc.gov/mmwr/volumes/66/wr/mm6608a3.htm. Accessed: 10/10/18. About Malignant Mesothelioma. American Cancer Society. Retrieved from: https://www.cancer.org/content/dam/CRC/PDF/Public/8733.00.pdf. Accessed: 10/10/18. Asbestos kills 12,000-15,000 people per year in the U.S. Asbestos Nation. Retrieved from: http://www.asbestosnation.org/facts/asbestos-kills-12000-15000-people-per-year-in-the-u-s/. Accessed: 10/10/18. Asbestos Toxicity Where Is Asbestos Found?. Agency for Toxic Substances & Disease Registry. Retrieved from: https://www.atsdr.cdc.gov/csem/csem.asp?csem=29&po=5. Accessed: 10/10/18. ASBESTOS. minerals.usgs.gov. Retrieved from: https://minerals.usgs.gov/minerals/pubs/commodity/asbestos/mcs-2017-asbes.pdf. Accessed: 10/10/18. Current Asbestos Ban. International Ban Asbestos Secretariat. Retrieved from: http://ibasecretariat.org/alpha_ban_list.php. Accessed: 10/10/18. U.S. asbestos imports condemned by health experts, activists. The Center for Public Integrity. Retrieved from: https://www.publicintegrity.org/2013/04/04/12434/us-asbestos-imports-condemned-health-experts-activists. Accessed: 10/10/18. Asbestos: elimination of asbestos-related diseases. World Health Organization. Retrieved from: http://www.who.int/mediacentre/factsheets/fs343/en/. Accessed: 10/10/18. Information at a glance. Asbestoswise. Retrieved from: http://www.asbestoswise.com.au/information-and-resources/. Accessed: 10/10/18. Malignant mesothelioma: up to 30% of US patients remain untreated. Univadis. 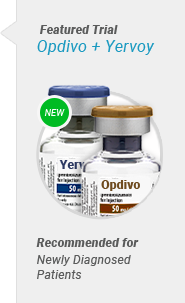 Retrieved from: https://www.univadis.com/viewarticle/malignant-mesothelioma-up-to-30-of-us-patients-remain-untreated-544957?sponsor=msd_oncology. Accessed: 10/10/18. Asbestos. U.S. Department of Veterans Affairs. Retrieved from: https://www.publichealth.va.gov/exposures/asbestos/index.asp. Accessed: 10/10/18. Malignant peritoneal mesothelioma: Epidemiology, risk factors, clinical presentation, diagnosis, and staging. UpToDate. Retrieved from: https://www.uptodate.com/contents/malignant-peritoneal-mesothelioma-epidemiology-risk-factors-clinical-presentation-diagnosis-and-staging?search=mesothelioma%20deaths&source=search_result&selectedTitle=1~150&usage_type=default&display_rank=1. Accessed: 03/11/19.